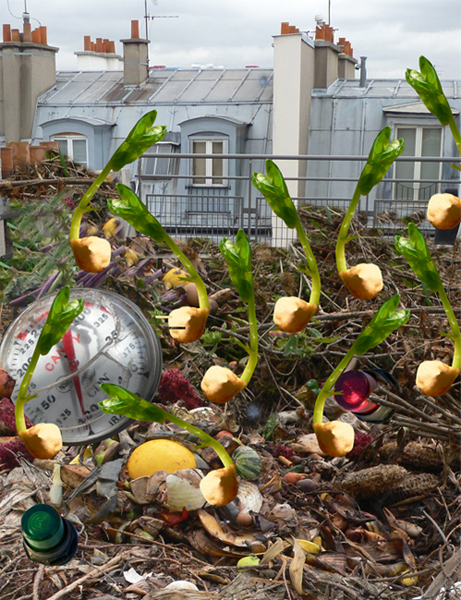 COMPOSTING THE CITY | COMPOSTING THE NET examines the parallel process of fermentation and degeneration of our daily food scrapes and our shared digital commons. Our daily consumption in the city and on the net guides our navigation through the merged actual/virtual zones where cybernetic organism expanded and exploded. While Composting the City checks in on discarded food scrapes and leftovers; Composting the Net sources the immaterial wealth/junk of net data. The food scraps thrown onto a compost heap are layered and mingled until all traces of identities are erased. On the net, the abundance of info-data sinks into a deep ‘reservoir’ with tags attached.